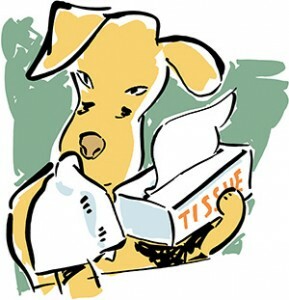 Andrea Lam, a board-certified veterinary dermatologist and assistant clinical professor at the Cummings School, responds to a reader’s question about her sneezing dog. Q: If my dog sneezes, does it mean she has allergies? However, sneezing in dogs has many different causes. A fungus, virus or bacterial infection, such as a sinus infection, can be at the root of sneezing. A foreign object as small as a blade of grass stuck in a puppy’s nose can cause it to sneeze. In older dogs, nasal discharge or a bloody nose, in addition to sneezing, may be a sign of a nasal tumor. So when your dog is sneezing, it’s best not to assume it’s simply seasonal allergies. Always start with a visit to your family vet for a thorough exam to rule out other things first. Please email your questions for “Ask the Vet” to Genevieve Rajewski, Editor, Tufts Veterinary Medicine, at genevieve.rajewski@tufts.edu.